Hiya guys! TGIF guys, it's finally time to sit back and enjoy our weekend. It's shaping up to be quite an eventful release weekend so be sure to stay tuned for more reviews tomorrow. 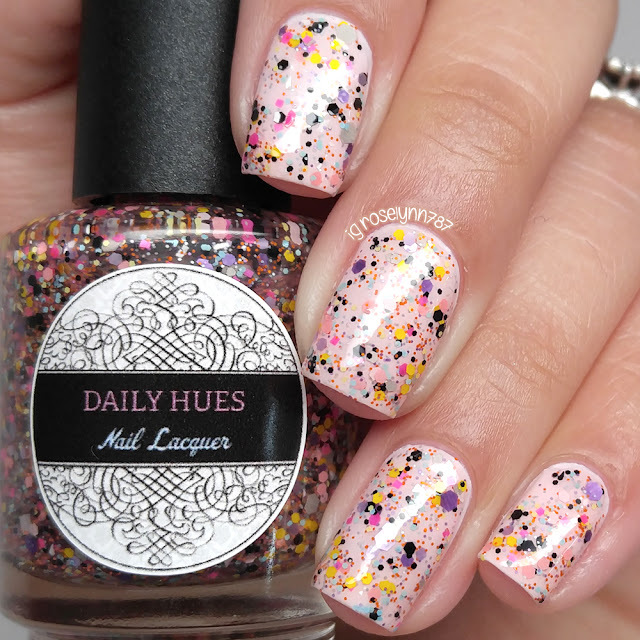 For today I'm sharing swatches for Part 2 of the Summer in Seattle Collection by Daily Hues Lacquer. Taking inspiration from the city of Seattle Washington, Jenn has created one huge collection just in time for summer. Part 1 is all inspired by Places to See while part 2 is inspired by Things to Do. I reviewed Part 1 of this collection a few weeks ago, if you'd like to see those then just click right on over. 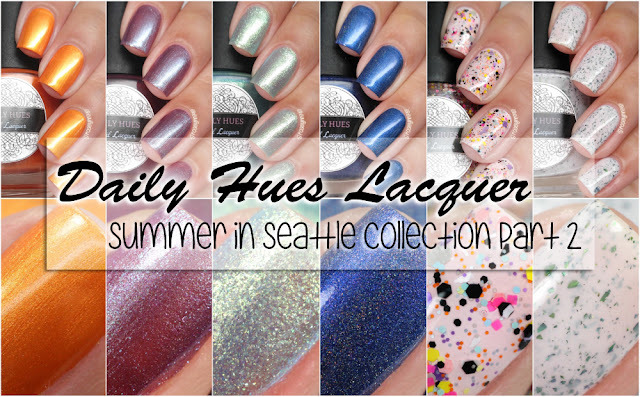 The Summer in Seattle Collection Part 2 by Daily Hues Lacquer is now available for purchase. Each full-size polish will retail between $8.50 to $10.50. The entire collection is also available to purchase for $51. Round and Round can be described as a deep purple with blue flecks. Inspired by the Great Wheel. Shown here in three coats and sealed with a topcoat. Day Trip To The Islands can be described as a light teal topper with hints of gold. Inspired by the Ferry system. Shown here in three coats and sealed with a topcoat. The Boat Races can be described as a deep blue linear holo. Inspired by Seafair, yearly hydroplane races and Blue Angels performance. Shown here in two coats and sealed with a topcoat. What band is next can be described as a white crelly full of teal/green UCC flakies. Inspired by one of the greatest music festivals, Bumbershoot. Shown here in two coats and sealed with a topcoat. Only in the Northwest can be described as a bright orange shimmer. Inspired by the hippiest and happiest of festivals "Folklife". Hands my favorite from the entire collection, including part one! The tone of orange is perfect against my skin-tone, I don't think I have ever had an orange suit me this well. Shown here in two coats and sealed with a topcoat. Naked Bike Ride can be described as a crazy glitter bomb with black, orange, white, yellow and pink matte glitters of all shapes and sizes. Inspired by the annual Fremont Solstice Festival, which includes a naked bike ride. Formula has a great application with ample glitter in each brush stroke and no need to fish. I I ended up doing some minimal dabbing with just the brush to spread the glitters evenly. 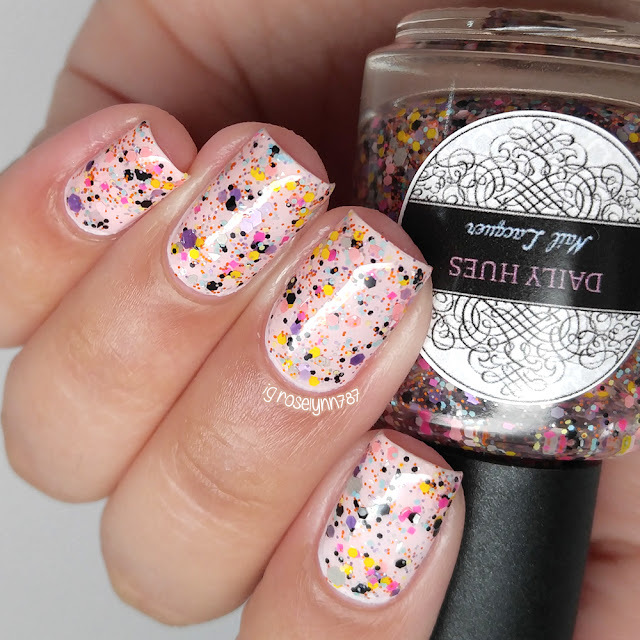 Shown in two coats over a pale pink base and sealed with a glossy topcoat. Overall this collection is full of wonderful formulas and equally great shades! I actually ended up loving this half of the collection more than the first half! This is probably due to my must-have picks Only in the Northwest and What Band Is Next. But tell me guys, what do you think of Part 2? And which one if your favorite? To recap, the Summer in Seattle Collection Part 2 by Daily Hues Lacquer is now available for purchase. Each full-size polish will retail between $8.50 to $10.50. The entire collection is also available to purchase for $51.